With only six days to go until Christmas (how did THAT happen?! ), I am slowly starting to pick up a little of the festive spirit. Until now, it's been difficult - distracted as I have been with my upgrade report. But this morning, I sent it off to my supervisor who has promised to look over it during the Christmas break. Hopefully there won't be too many corrections to make before I can then submit the final version and my lab work can begin in earnest. With my report sent off, I was free to join in the Departmental Christmas Party. 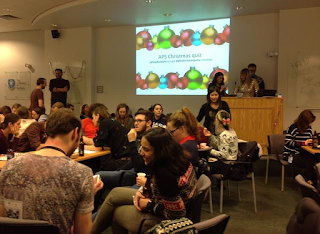 Although the beer was flowing freely, the highlight for everyone was the famously imaginative Christmas Quiz, featuring just about every supervisor, lecturer and technician in the building. The rounds included everything from a"Swapped-Faces" photo round, to cryptic riddles that tenuously linked to a supervisor's surname, to "Car-Pool Karaoke"... but perhaps things got a little out of hand for the 'Modelling Round'. I had naively presumed this would involve plasticine...instead, we were challenged to dress one of our team in an outfit appropriate for our Head of Department to wear for one of his preferred leisure pursuits....using toilet roll. Some teams got quite competitive with this; fortunately our Head of Department took it all in good humour! My favourite had to be the round where staff members had been transposed into famous movie scenes....anyone remember when someone "just had to go" in Jurassic Park? Might be a while before that staff member lives it down! 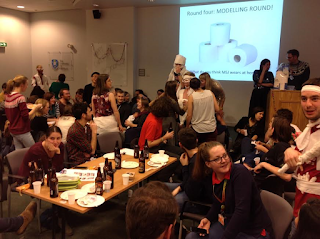 Now that the party's over, the labs will rapidly start emptying for the holidays. And I too will be heading home for a few days with my parents. Work never stops though as I do have a few writing projects to work on during the 'downtime'. Given that my research will (hopefully) be even busier next year, it's vital that I start to limit these extra-curricular activities ...the trouble is, I just can't seem to say 'no', especially when I spot the makings of a good story! So with that, I wish you a very Happy Christmas - may the festive season bring you many opportunities for sharing happiness and peaceful times with your loved ones. And I give you my best wishes for the new year.